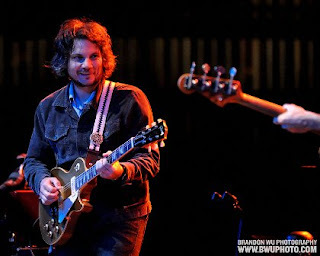 I defy you to prove to me that there is a better band today than Wilco. I also think you can't find a better guitarist than Nels Cline, whose ripping and dorky moves supplied much of the drama in Wednesday night's unbeatable show at Wolf Trap in Virginia. There were many highlights but I'd have to say my favorites were the long, proggy versions of "Impossible Germany" and "Kidsmoke," the late-era Beatles-ish "Hate It Here," and pop gems "Misunderstood " and "Heavy Metal Drummer" (about Tower Lake Apartments in Edwardsville and The Landing in St. Louis). "You and I" and "You Never Know" from the new album are also already-classics. The extra treat of seeing Conor Oberst play a "greatest hits" set just added to the beautiful July night. The only bad part was that the lawn was so full that we couldn't see the stage. So we ate and partied through that set before I scored a ticket into the Exxon box, front-and-center in the first row of the balcony. Don't ask how a greenie like myself scores a spot in the Belly of the Beast, but, put it this way, I won't say anything bad about Exxon ... for at least a week or so.